Harmonix is reviving the rhythm genre with ‘Rock Band 4,’ and we’ve seen it in action! It’s been a long time since we’ve been able to pick up our plastic instruments and live out our rock fantasies in the comfort of our homes (without the lawsuits and STDs). That’ll all change this Oct. 6, though, when developer Harmonix is finally bringing back Rock Band and all the fun that comes with it. Luckily, Harmonix seems quite aware of the oversaturation that killed the genre in the first place, and has stated that they’re working to make sure your instruments from previous Rock Band games work with the new one, as well as produce new ones for anyone who has lost them in the time since music games ruled the world. 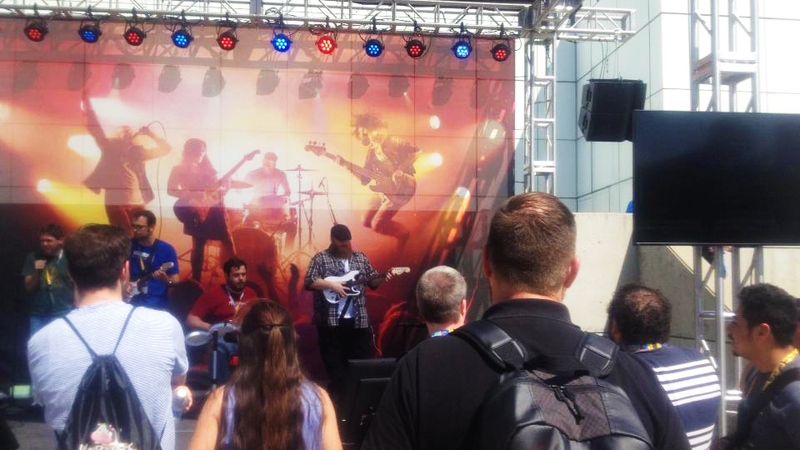 The demo Harmonix had at E3 was ingeniously set up like a stage, with groups of four heading up to play songs from an impressive 4,000-song library, containing everything from Paramore to Tenacious D to Billy Idol. The gameplay itself is a snappier, more responsive version of the tried-and-true Rock Band gameplay, with the player hitting notes on a track to play the song. Guitar, Drums, Bass and Vocals are all back, and you can play them in any combination. The graphics are an enhanced-looking version of the breezy, cartoon-y look of past games. It looks and feels just like old times, and that’s not a bad thing. When it comes to music games, if it ain’t broke, don’t fix it, and Rock Band 4 seems to know exactly what to innovate on and what to leave alone. What is new, though, is the way you’ll be interacting with the crowd. As in previous games, the crowd will react to how many notes your hitting, but Rock Band 4 expands on that by having the crowd do other things like request songs and scream for encores. There now is also a system that allows you to pick a setlist beforehand, or even change songs at the tap of a button, negating the need to return to song selection to play again. While the demo was limited to one song per group (for obvious reasons), the new song selection tools look like they will certainly make the game flow better and is a welcome improvement. Overall, it seems like Harmonix has learned all the right lessons from the rise and fall of the music game, and if Rock Band 4 will indeed be their only game this generation, it’s both a triumphant return and a great note to go out on. Gone are the gimmicks, piles of expensive controllers and annual releases. If the demo is anything to go by, it’s just going to be you, your friends and your music, just how it was always meant to be. Are you excited to rock out once more, or are you still burned out on music games? Tweet me @MaxMielecki. And be sure to follow us @YouNerded.